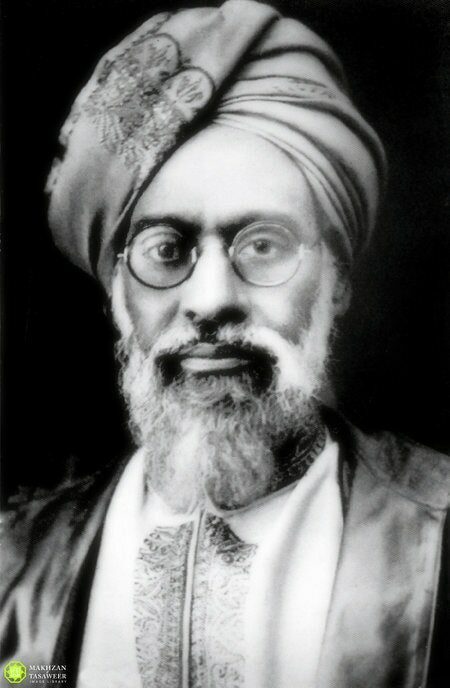 After the establishment of the Jamaat, the Promised Messiah, Hazrat Mirza Ghulam Ahmadas, soon initiated Jalsa Salana. Its purpose was to increase righteousness amongst members of the Jamaat, to establish a firm belief in the hereafter, to increase love and a sense of brotherhood, to strengthen faith and belief whilst excelling in true knowledge. The Jalsa Salana was initiated to serve as a mode to increase deeper knowledge and a place where members could acquire spiritual knowledge. These divine words, when voiced by the Promised Messiahas, began to show their grandeur instantly. And when the branches of Jalsa Salana spread out of Qadian to other places like Rabwah, USA, UK, Ghana, Nigeria, Indonesia, Germany and many other countries, the grandeur of these blessed words expressed themselves in a new light. 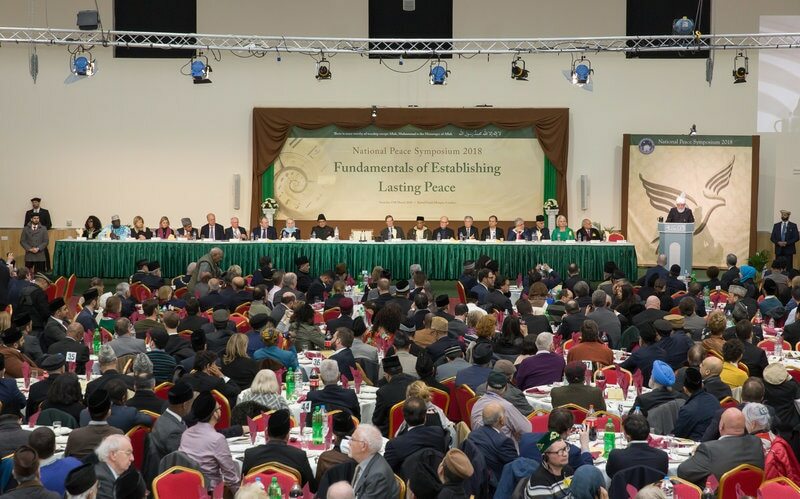 One of the branches of Jalsa Salana now overshadows an important country of Europe – Germany. The first Jalsa held in Germany was in 1975 in which approximately 70 people attended. In contrast, by the grace of Allah, just last year’s 42nd Jalsa Salana 2017 in Germany saw an attendance which exceeded 40,000. The first Jalsa Salana in Germany took place on Sunday 28 December 1975 in Masjid Fazl-e-Umar, Hamburg; commencing at 10am, concluding at 7pm. The inaugural and concluding sessions were chaired by Fazl-e-Ilahi Anwari Sahib who was the Amir and Missionary In-charge of Germany. 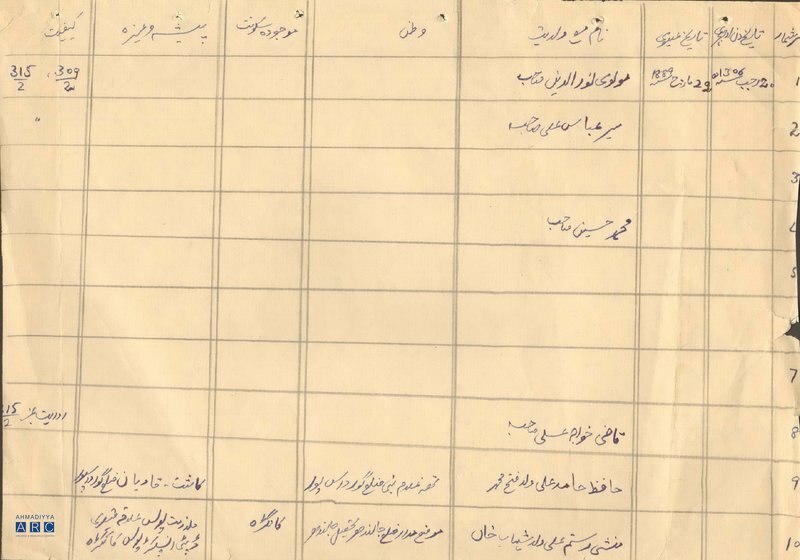 A list has been found of the attendees of this Jalsa which includes members from Denmark, Frankfurt and 23 other participants from various countries. This inaugural Jalsa saw a total of six speeches delivered in which one was delivered by Al-Haj Nuh Sven Hansen of Denmark. Competitions were also held amongst the participants of the Jalsa which included tilawat, nazm, speeches and religious knowledge competitions. The third Jalsa Salana also took place in Masjid Fazl-e-Umar in Hamburg and the duration of the Jalsa was also increased – lasting two days, from 24 to 25 December 1977. This Jalsa Salana was, for the first time, named “Jalsa Salana West Germany” – 250 in attendance, including 30 non-Ahmadi guests. The guests consisted of Jamaat members from England, Norway and members from 42 cities of Germany. For the first time, a message was sent for the Jalsa from the Markaz in Rabwah by Wakil-ut-Tabshir and was read out by Chaudhry Abdul Latif Sahib who served as a missionary in Germany. Jamaat-e-Ahmadiyya Germany witnessed its fourth Jalsa on 24-25 December 1978 in Masjid Fazl-e-Umar, Hamburg in which a total of 120 people attended. The organisational committee was headed by Laiq Ahmad Munir Sahib who served as missionary in Hamburg. The inaugural address was delivered by Missionary In-charge, Nawab Mansoor Ahmad Khan Sahib. The special guest of this Jalsa was Izet Olevic Sahib from Sweden. A question and answer session was also held in which participants took keen interest. A documentary on Hazrat Khalifatul Masih III’srh tour of Germany and London was also shown. The Jalsa Salana that took place in 1980 was a two-day Jalsa lasting from 5 to 6 April in Masjid Fazl-e-Umar, Hamburg. The Jalsa was not held the previous year due to some reasons, therefore this was the fifth Jalsa and also the last in Masjid Fazl-e-Umar, Hamburg. The reason for this shift from Hamburg was because many Ahmadis had migrated to Germany by that time and were mostly situated in and around Frankfurt, therefore it was easier for everyone to reach Frankfurt as compared to Hamburg. So, the decision was made to relocate the Jalsa to Frankfurt from Hamburg for the following year. The inaugural and concluding sessions of this Jalsa Salana were chaired by Amir and Missionary In-charge, Nawab Mansoor Ahmad Khan Sahib whilst the special guest was Muniruddin Shams Sahib from London who delivered an English speech entitled “Tabligh of Islam in England and the Future of Ahmadiyyat”. 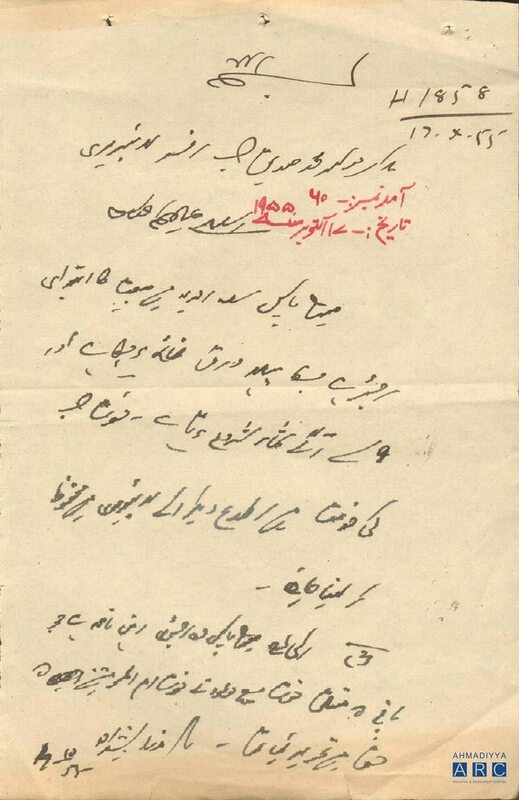 For this Jalsa, a message was also received from Wakil-e-Ala, Mirza Mubarak Ahmad Sahib from Rabwah. From the German populace, Abdullah Uwe Wagishauser Sahib delivered a speech entitled “My Experiences of Jalsa Salana Rabwah and Qadian” whilst Hadayatullah Hubsch Sahib delivered a speech entitled “Practising Islam in a Westernised Atmosphere” which was greatly attended by the audience. On the second day, a separate session for Lajna Imaillah also took place. 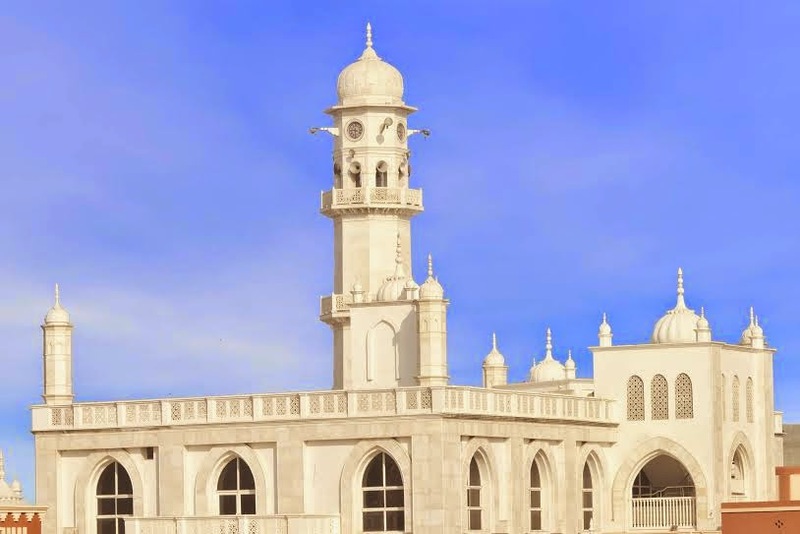 The final attendance of the Jalsa reached 700, a number that greatly surpassed the capacity of Masjid Fazl-e-Umar and many marquees had to be erected on the lawns that surrounded the mosque. In fact, the turnout was such that many had to sit on the roads and in the neighbours’ gardens, according to Laiq Ahmad Munir Sahib. 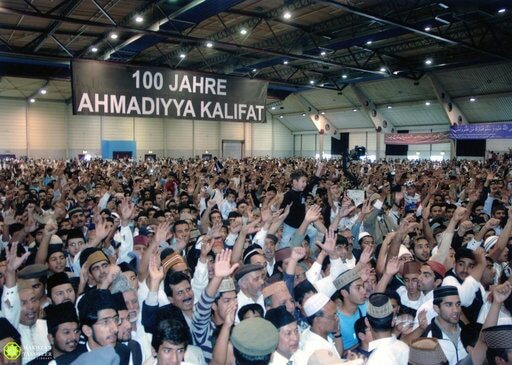 The attendance of Jalsa Salana Germany was increasing yearly, and by 1984, there was a strong need for an open space to be acquired to accommodate these numbers. Allah the Almighty blessed the Jamaat with a plot of land 40 kilometres away from Frankfurt; it was in Gross-Gerau and was named Nasir Bagh; the Jalsa of 1985 was held here. The attendance of this Jalsa exceeded 1,200 in which eight countries were represented and included 25 German Ahmadi converts. Syed Kamal Yusuf Sahib and Mustafa Thabit Sahib were the special guests of this Jalsa. 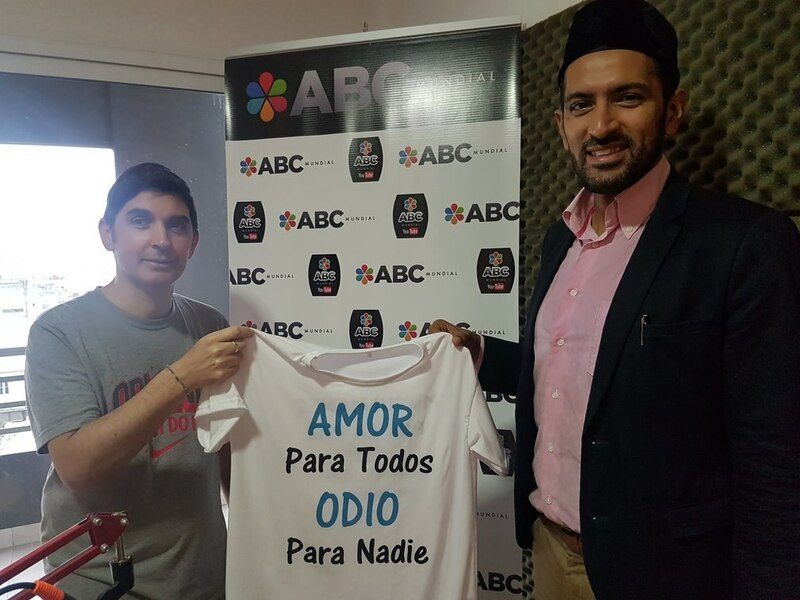 For the first time, Urdu and English speeches were also translated into Arabic and German. Small tents were pitched for various departments and a special area was allocated for a car park. 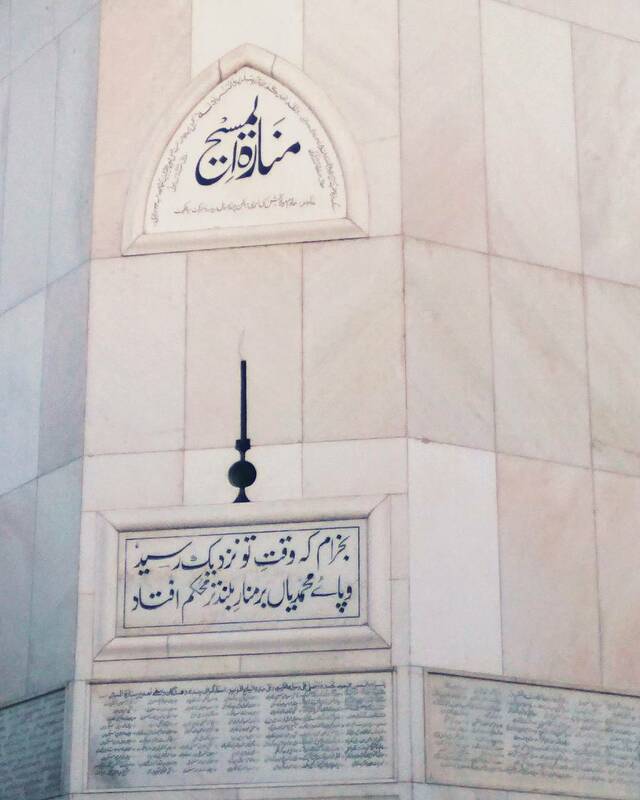 The loudspeaker was used for the Azan, various prayers (Zikr-e-Ilahi), Durud Sharif, Urdu poems, slogans and announcements during the Jalsa – this was reminiscent of the atmosphere of Jalsas in Qadian and Rabwah. Ahmadis arrived from various parts of Germany in groups and were all welcomed in a very beautiful manner. There was also a service to collect guests arriving at the train station. Thus, the attendees of this Jalsa enjoyed an open atmosphere where they could gain all the blessings of the Jalsa. It was during this year that Hazrat Khalifatul Masih IVrh appointed Abdullah Uwe Wagishauser Sahib as the Amir of Germany; the Jalsa of 1985 was also organised under the supervision of Abdullah Uwe Wagishauser Sahib. Until that point, Jalsa Salana Germany would receive messages full of love from Hazrat Khalifatul Masih, however the Khalifa of the time had never been able to actually attended the Jalsa in person. Jamaat-e-Ahmadiyya Germany was blessed for the first time with the presence of Khalifatul Masih when Hazrat Khalifatul Masih IVrh decided to attend Jalsa Salana Germany for a few hours whilst he was on his tour of Holland in 1987. On the first day of Jalsa, Hazrat Khalifatul Masih IVrh delivered his Friday Sermon in a field at Nasir Bagh and led prayers. When Huzoorrh arrived for the Friday Sermon, members of the Jamaat raised slogans. Huzoorrh immediately told Jamaat members that when the Imam arrives for the Friday Sermon, no slogans should be raised prior to or during the sermon. During the sermon, Hazrat Khalifatul Masih IVrh set a target for Jamaat-e-Ahmadiyya Germany to bring 1,000 native Germans into the fold of Islam Ahmadiyyat before the centenary of the Jamaat. The inaugural session of the Jalsa, after Jumua Prayers, was also chaired by Huzoorrh. After tilawat and nazm, the atmosphere of the Jalsa suddenly erupted with slogans, at which Huzoorrh remarked that slogans should be raised in an organised manner. Then, Huzoorrh himself raised slogans, showing the proper method. When Huzoorrh raised a slogan for Asiran-e-Rah-e-Maula (Ahmadis imprisoned due to their belief in Ahmadiyyat) his voice trembled with emotion. After the slogans, Huzoorrh then said, “Come, let us pray.” After the prayer, Huzoorrh instructed that the programme of Jalsa continued and then departed after bidding “Assalamo Alaikum” to the attendees. On the first day of this Jalsa, external guests had the good fortune of sitting with Huzoorrh at 5pm. 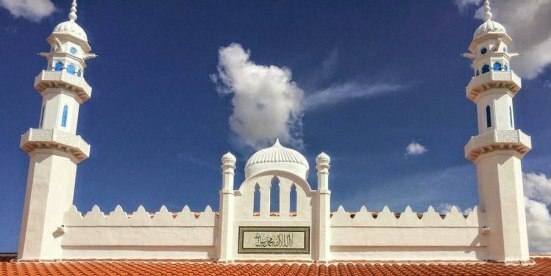 After the event, Bai‘at also took place in which five Germans and Arabs entered the fold of Islam Ahmadiyyat at the hand of Hazrat Khalifatul Masih. Jamaat-e-Ahmadiyya Germany has been blessed in that Hazrat Khalifatul Masih IVrh attended every Jalsa (except 1999 and 2002) since 1987. Hazrat Khalifatul Masih IVrh blessed the 13th Jalsa Salana in 1988 that was held in Nasir Bagh in which he delivered inspirational and spiritually rejuvenating speeches during the inaugural and concluding sessions. Huzoorrh also gave the opportunity to the Jamaat for a question and answer session. Masood Ahmad Jhelmi Sahib of Switzerland also attended the Jalsa. The Jalsa had a total attendance of more than 5,000 participants. At the completion of 100 years of the Jamaat in 1989, celebrations were held by Jamaats throughout the world. During that year, Jalsa Salana was held from 12-14 May, and in many ways, it held a special grandeur. Hazrat Khalifatul Masih IVrh blessed the Jalsa with three insightful addresses, the third of which was in the Lajna Jalsa Gah. This was historical as it was the first time in which Hazrat Khalifatul Masih delivered an address in the ladies’ side during Jalsa Salana Germany. A question and answer session was also held for external guests in which 350 guests attended. The total Jalsa attendance exceeded 7,000 in which 165 representatives from 15 countries attended. Two key-figures of the local city attended along with the Ambassador of Kenya to Germany. During that Jalsa, all speeches were translated simultaneously into German and English. A special session was also held during the 1989 Jalsa on the life of Prophet Muhammadsa in which guests delivered speeches, including Ataul Mujeeb Rashed Sahib, Bashir Ahmad Khan Rafiq Sahib, Mubarak Ahmad Saqi Sahib and, from Spain, Karam Ilhahi Zafar Sahib. During the concluding session of this Jalsa, Amir Jamaat Germany presented a special plaque to Huzoorrh while Sami Arif Sahib presented a beautiful model of Minarat-ul-Masih to Huzoorrh. It was during this Jalsa that Huzoorrh, whilst showing his love, initiated the 100-Mosque Scheme for Germany Jamaat (Akhbar-e-Ahmadiyya Germany, July 1989). A new millstone was reached during Jalsa Salana Germany in 1990 when the attendance reached 10,000 – the Jalsa was held from 1-3 June in Nasir Bagh, Gross-Gerau. By that time, the car park – usually located in the premises of Nasir Bagh – was insufficient, and another nearby field had to be acquired for this. Nasir Bagh became too small for Jalsa Salana, hence another large premises called Maimarkt was hired to accommodate the Jalsa. Situated in the famous city of Mannheim – 90 kilometres from Frankfurt – the 20th Jalsa Salana Germany was held in Maimarkt on 8, 9 and 10 September 1995. The men’s Jalsa Gah was in the main area of Maimarkt and there was widespread worry that due to its vastness, it would seem empty. However, Divine decree had it that from the very first day to the last, the hall remained full with Jalsa guests. The attendance of Jalsa Salana exceeded 17,000 from 30 different countries. A separate Lajna Jalsa Gah marquee was also erected while special marquees were put up for serving food. An area was allocated for private tents where guests could pitch their own tents and a very large area was also used for car parking which was located just outside of Maimarkt. Registration, security and toilet facilities were specially made which was convenient for the guests. Another convenient arrangement of Maimarkt was that Hazrat Khalifatul Masih’s residence was within the premises; this meant that Huzoorrh did not have to travel long distances to reach the Jalsa Gah every day. This place was blessed and was used for 16 years until 2010. 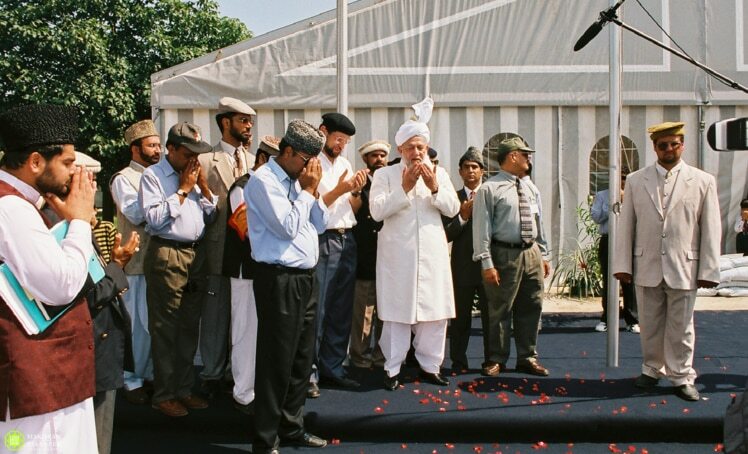 A special aspect of Jalsa Salana Germany in 1997 held in Maimarkt, Mannheim from 15-17 August was that along with Hazrat Khalifatul Masih IVrh, many members of the blessed family of the Promised Messiahas attended the Jalsa; these included Hazrat Mirza Masroor Ahmadaa, Khalifatul Masih Vaa, Sahibzada Mirza Mansoor Ahmad Sahib, Nazir-e-Ala and Amir-e-Muqami Rabwah, Syed Mir Mahmood Ahmad Nasir Sahib and Mirza Umar Ahmad Sahib. The total attendance was 21,000 from more than 30 different countries. During this Jalsa, Huzoorrh reminded the Jamaat of the 100-Mosque Scheme and announced a promise of 150,000 Deutsche Marks from himself and on behalf of his children and late wife for the scheme. The Jalsa which followed in 1998 was organised into 62 departments in which 4,000 volunteers served. The total attendance was more than 23,000. Hazrat Khalifatul Masih IVrh could not attend Jalsa Salana 1999. The chief-guest was Abdul Wahab Adam Sahib, Amir Jamaat Ghana, who hoisted the flag to inaugurate the Jalsa and delivered a speech in Urdu, which proved of great interest for the audience. The year 2000 marked the silver jubilee of Jamaat-e-Ahmadiyya Germany. A total of 23,000 guests attended from 40 different countries. The guests who delivered speeches included Muhammad Azam Akseer Sahib of Rabwah and Naseer Ahmad Qamar Sahib of London. During this Jalsa, speeches were translated simultaneously into 10 different languages. Due to frail health, Hazrat Khalifatul Masih IVrh could not attend Jalsa Salana Germany in 2002 – the atmosphere during Jalsa was not the same, however the 23,000 attendees prayed for Huzoor’srh health. In 2002, Hakim Muhammad Din Sahib from Qadian, Dost Muhamad Shahid Sahib and Sahibzada Mirza Ghulam Ahmad Sahib from Rabwah, and Ataul Mujeeb Rashed Sahib from London attended the Jalsa and delivered speeches. 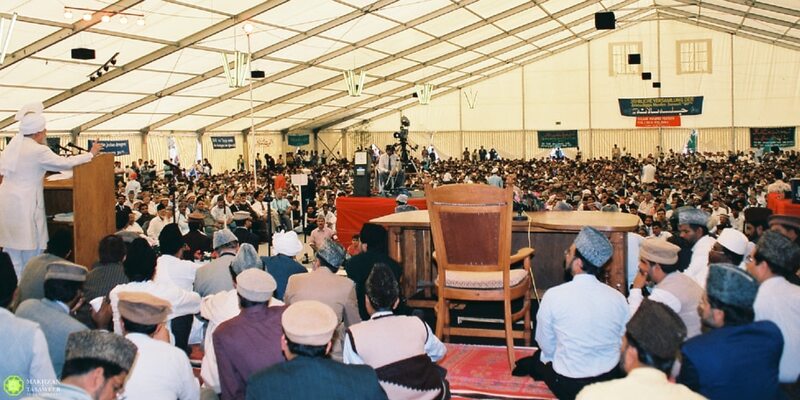 The Jalsa of August (22-24) 2003 was the first Jalsa during the period of Khilafat-e-Khamisa and Huzooraa blessed the 31,000 attendees of the Jalsa with his presence and his speeches. The guest speakers included Wakil-e-Ala Tahrik-e-Jadid, Chaudhry Hameedullah Sahib and Akhlaq Anjum Sahib, London. Hazrat Khalifatul Masih Vaa also inaugurated the Jalsa Salana in 2004 with the Friday Sermon and hoisting of Liwa-e-Ahmadiyyat. Huzooraa delivered a speech at the Lajna side on the second day whilst also delivering a concluding speech on the final day of Jalsa. A special meeting was also held on the second day of Jalsa Salana with external guests and the meeting was blessed with the presence of Hazrat Khalifatul Masih. Nazir Islah-o-Irshad, Raja Naseer Ahmad Sahib from Rabwah and Mubarak Ahmad Nazir Sahib from Canada attended as guest speakers. From 31 August to 2 September 2007, Jamaat-e-Ahmadiyya Germany held its 32nd Jalsa. During this Jalsa Huzooraa announced that Jamaat-e-Ahmadiyya Germany had included fifty percent of those eligible to donate chanda [financial sacrifice] in the system of Wasiyyat, thus reaching the target that Huzooraa had set for them. The attendance of this Jalsa exceeded 26,000 people from 28 countries. Over 5,000 volunteers worked day and night to organise the Jalsa. The Jalsa Salana of 2008 was named the Khilafat Jubilee Jalsa as a hundred years had passed of the institution of Khilafat-e-Ahmadiyya. 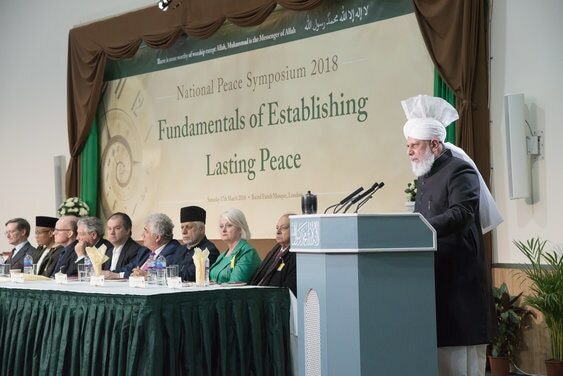 All speeches were based on the topic of Khilafat. A total of 37,000 people from 40 countries attended the Jalsa. The speeches were translated live in nine different languages. More than 5,000 people were volunteering in setting up and running the Jalsa. Jamaat-e-Ahmadiyya Germany held its 34th Jalsa Salana from 12-14 August 2009 in Mannheim, Maimarkt. A total of more than 32,000 people from 44 countries attended. Guest speakers included Nazir Taleem, Syed Tahir Ahmad Shah Sahib of Rabwah. After the Lahore attacks, the first occasion in which Jamaat members gathered in such a large number was during Jalsa Salana Germany in June 2010. Every Ahmadi was emotional due to the heartfelt speeches delivered by Hazrat Khalifatul Masih Vaa. Two poems were specially read out prior to the final session speech, on the instruction of Huzooraa; the first, written by Hazrat Musleh Maudra entitled “Dushman ko zulm ki barchi se” and the second, written by Hazrat Khalifatul Masih IVrh entitled “Do ghari sabr se kam lo sathiyo”. The emotions of the audience after these poems were recited depicted a scene worthy of being witnessed. “Expand thy house”, Jalsa Salana Germany had to be relocated. The last Jalsa in Mannheim in 2010 saw an attendance of more than 25,000 people. With the permission of Hazrat Khalifatul Masih Vaa, the 36th Jalsa Salana Germany was held on 24-26 June 2011 at the DM Arena in Karlsruhe for the first time. This new area is 160 kilometres south of Frankfurt and has four identical large halls. Each hall is 12,500 square metres with a capacity to hold 16,000 people. Apart from these four large halls, there are numerous smaller halls, corridors and rooms around the premises. The complex is state of the art. Out of the four main halls, two are used for the ladies’ and men’s Jalsa Gah whilst the other two are used for the Langar, accommodation and various offices. In the centre of the complex lies a beautiful green plot of land on which a stage is made for the flag hoisting ceremony. This area is also used for a studio for the various programmes of MTA International during Jalsa. Huzoor’s residence being close by in the Jalsa Days means Huzooraa regularly blesses the participants of Jalsa with his presence throughout the three days. Hazrat Khalifatul Masih Vaa also, through his kindness, blessed the 36th Jalsa Salana in Karlsruhe with his presence. He delivered spiritually-charged addresses, held meetings with students and also blessed new Ahmadis with mulaqats. With the permission of Huzooraa, Muhammad-ud-Din Naz Sahib from Rabwah and Naseem Mahdi Sahib from Canada attended this Jalsa and delivered speeches. A special speech was also delivered by Munir Ahmad Javed Sahib, Private Secretary to Hazrat Khalifatul Masih, on the topic, “A Living Connection with Khilafat”. The Jalsa proved to be more successful and comfortable in the new complex and due to the increasing number of guests, further expansion is being made as each year passes. Last year, at the 42nd Jalsa Salana, adjustments had to be made to the car parking facilities and a new car park was set up across the road from the main complex, whilst separate marquees were erected for the Langar Khana and kitchen within the complex. The bazaar was already within the proximity of the complex, however, another portion of the complex had to be reserved for 1,500 private tents. And so, now, this complex is proving insufficient for the guests that now exceed 41,000 – a living testimony to the fulfilment of the prophecies of the Promised Messiahas. Accordingly, Hazrat Khalifatul Masih Vaa has instructed Jamaat-e-Ahmadiyya Germany to find an open piece of land like Hadiqatul Mahdi so that we can expand the Jalsa according to our needs. May Allah enable us to quickly obtain a piece of land that fulfils the desires Hazrat Khalifatul Masih has of us.